We report the development of the SEVENS database, which contains information on G-protein coupled receptor (GPCR) genes that are identified with high confidence levels (A, B, C, and D) from various eukaryotic genomes, by using a pipeline comprising bioinformatics softwares, including a gene finder, a sequence alignment tool, a motif and domain assignment tool, and a transmembrane helix predictor. SEVENS compiles detailed information on GPCR genes, such as chromosomal mapping position, phylogenetic tree, sequence similarity to known genes, and protein function described by motif/domain and transmembrane helices. They are presented in a user-friendly interface. 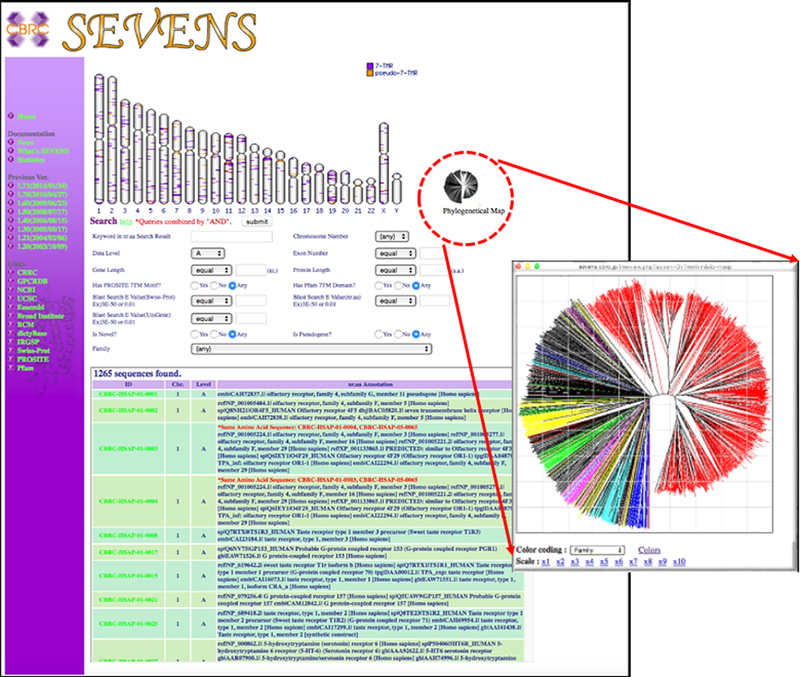 Because of the comprehensive gene findings from genomes, SEVENS contains a larger data set than that of previous databases and enables the performance of a genome-scale overview of all the GPCR genes. We surveyed the complete genomes of 68 eukaryotes, and found that there were between 6 and 3,470 GPCR genes for each genome (Level A data). Within these genes, the number of receptors for various molecules, including biological amines, peptides, and lipids, were conserved in mammals, birds, and fishes, whereas the numbers of odorant receptors and pheromone receptors were highly diverse in mammals. SEVENS is freely available at http://sevens.cbrc.jp or http://sevens.chem.aoyama.ac.jp.